By Neil Diamond. Arranged by Glenda Lloyd. Sheet Music Single. 6 pages. Published by Lloydsong (H0.335797-800900). This fun four part a cappella arrangement will captivate your audience, and provides an opportunity for audience participation (Ba! Ba! Ba!). This version of this arrangement is notated with the exact timing as performed by Frenzy Quartet on their album "Diva Las Vegas"...sing along with their CD! 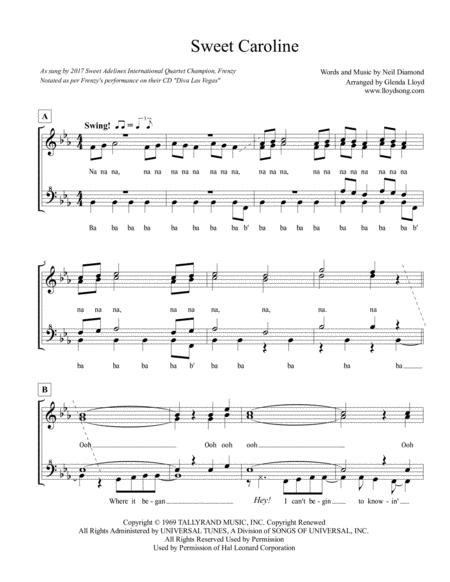 You'll also find a standard version of this song available here at Sheet Music Plus. 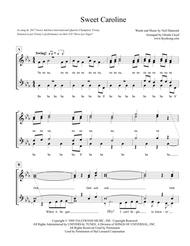 Also available notated for SSAA - see my other listings.